This Book of Affirmations will be a long term project, as each page takes some time. I'll just keep slowly adding to it over the next many month, while still going through my affirmations on index cards every morning. But it will be more inspiring when they are all finished. This one you can see is midway. I'm just starting the tree. 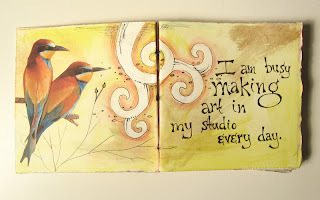 In the last two journals, I kept adding details to almost all the pages long after they were mostly complete. It's a way of integrating them all together. Your blog is inspiring! Thank you! Love your blog and your great ideas! I need an affirmation journal. Thanks Eilidh (how to say that?!) and Suzan! I'm glad if I can inspire someone else while I'm trying to boost my own inspiration. Already looking forward to fill it with my inspirational cut-outs from magazines and add my view on it. Hoper you'll share yours, Helga! Eilidh is Scottish Gaelic for Helen and is prounounced (roughly) "Ailey". It's not my real name--when I was setting up my blog I accidently wrote it in for the name of my blog (which was supposed to be just Copper Beech)so I was stuck with it. But I like the name anyway and use it in my Gaelic classes!